The final V.E.S. Precision match arrived and as the rain had held off we were actually able to get back on the river. On the league front, Fieldy was uncatchable but it was all very tight for the second and third places with Heardy and me on 12 points and Bruce on 13. I got to the pub and it was nice to see Neil Dring for the first time in ages, I paid my pools and Rob said Bruce wasn’t fishing today as he’s not very well, I hope you feel better soon mate. A quick look at the pegs and Rob had pegged the lower end of the river and I didn’t really fancy Redbridge today as it would be pretty exposed. 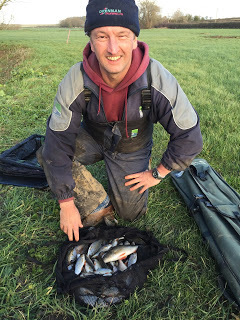 I drew quite late and was hoping to see the numbers 128 on my peg but had to settle for H1, which was the first swim below the road at Hambridge and one of the best pegs on the river, that’ll do! Rob drew 128 again which was also a golden peg and he was last seen asking Karl about the best way to get Wi-Fi installed! Fieldy was on H2 below me and John Dursley and Baz were the two pegs above the bridge. Heardy had drawn 129 which was in the same section as me so it would be a straight shoot out to see who finished in second place in the league. I got to the river and as I was unloading my kit, I realised I’d left my wellies at home! Not a great start and I hoped it wasn’t an omen! Luckily it was pretty mild so hopefully my feet wouldn’t get too cold. Setting up, the wind was howling down the river and it was a job to hold the pole at 8.5 metres! I set up a 1 gram Drennan Tipo with 0.10mm bottom and a size 18 B611. The swim looked lovely with lots of cover on the far bank but unless the wind calmed down I wouldn’t be able to fish over there! Some nice features on the far bank but would I be able to get near them! 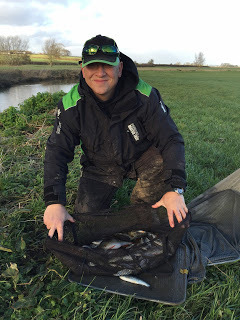 The start time arrived and I tried fishing three sections to hand but never had a bite and as Fieldy already had a couple of small fish I didn’t persevere with it for long. Out to 8.5 metres with the hook buried in a caster and I tried to inch the float through and maintain some control but the wind was hideous, the float buried and a fair bit of elastic came out and my first fish was a 3-4oz roach that I swung in when I probably should have netted it. Next chuck I had one of 2oz, this was easy, I was going to sack right up!, then I had a tiny roach but the next two fish were tiny gudgeon and any thoughts of breaking the match record soon disappeared! 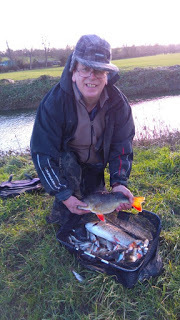 I carried on catching the odd small roach and gudgeon but wasn’t putting much weight in the net but then I hooked a better fish which turned out to be a nice perch around 8oz and I hoped a few more would show during the day. Fieldy was catching quite a few small fish and I could see John Dursley on the other side of the bridge swinging in some small roach as well. After an hour I’d had 20 fish for around a pound and a half but I needed my catch rate to improve if I was going to get in the money today. The second hour was very similar but the wind was just an absolute nightmare, I was feeding and fishing down the middle but also feeding across by the cover on the right and would hopefully be able to go across when the wind dropped later (or was that just wishful thinking!). 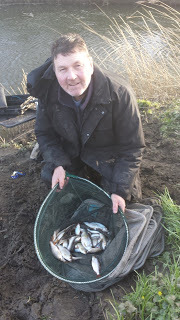 Hurf turned up for a chat and I had some nice roach while he was there but also had a funny five minutes where I lost a decent roach, another dropped off when I swung it in, I hooked my keepnet and bumped a couple of fish as well, you’re a bloody jinx Hurf! 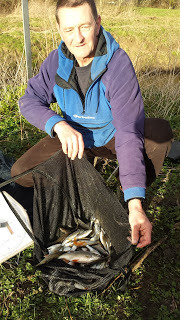 After he left me to it, I continued catching mainly roach and gudgeon along with the odd small dace and chublet but the lack of quality was a bit worrying. With an hour and a half left, the wind dropped enough for me to add a couple of sections and fish by the cover where I’d been feeding hemp and caster for four hours but it was a bit of an anti-climax and I only added the odd roach and gudgeon. Fieldy had a decent perch and I thought it was going to be really tight between us. By the end of the match my clicker was reading 102 fish but I’d had a lot of gudgeon and I knew I had nowhere near double figures. 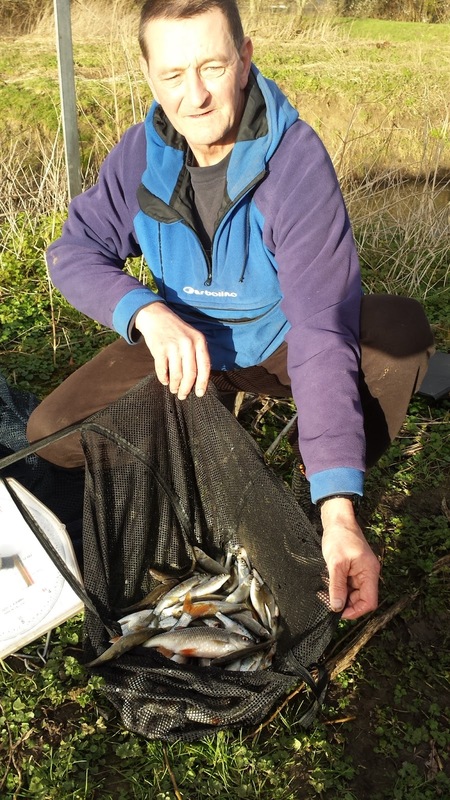 I walked down to weigh Fieldy in and he’d had 142 fish including that nice perch but he’d also had a lot of gudgeon and about twenty ruffe! The needle stopped at 8lb 2oz and I didn’t think I had that and I was right but it was closer than I thought as my fish weighed 7lb 8oz and I’d had some better quality fish but I needed a couple more. 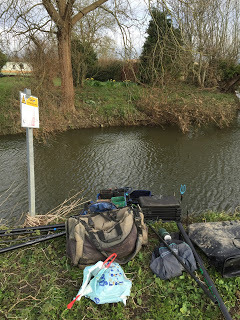 As we took the kit back to the cars we walked across the road to see how the other two had got on and John had a lot of small fish for 5lb and Baz had 12lb 9oz which included a big chub and a lovely 2lb perch. Thanks to John Dursley for the photo*. We drove back to meet the others and I was sure Heardy would have done enough to clinch second in the league. The lads from Redbridge were already back and as expected it had been hard going with Justin having the top weight with 5lb although the bulk of that was a 4lb 8oz chub and he lost one too! 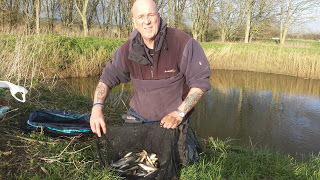 The others turned up and Rob had the top weight at Isle Brewers with 10lb 9oz and Steve P had 4lb 2oz so I was a pound better off at least but how had Heardy got on? He’d weighed 6lb 2oz so I’d beat him by a point to secure second place in the league and I picked up £60 and for good measure Rob gave me £15 for winning the section (by double default!). Thanks to Rob Cox for the photos**. The club would like to say a massive thanks to V.E.S. Precision for their continued and very valued support, also to Steve and Cindy at the Royal Oak, Ilminster for looking after us so well every Sunday and last but certainly not least to Rob Cox for all the time and effort he puts in organising an excellent league.